Find My Workspace lists over 95% of the business centres market in Brentwood (United Kingdom). Simply click Request Quote to check pricing for one office, or Add to Basket for multiple offices. ​This centre, located in a credible High Street address, is a great space with great amenities. 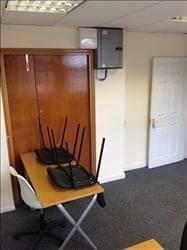 Tenants can benefit from the computer network facilities and telephone point, as well as well a receptionist service and mail forwarding which is available for at an extra cost. The space and rental feel are fully inclusive of Water and Electricity as well as a ready workspace with an office chair and desk. This building features two offices, one of 196 sq. ft. and one of 552 sq. ft. in size.